Sheriff’s Deputy Kanesha Carnegie was sitting outside a Florida gas station when she caught sight of something that touched her heart. 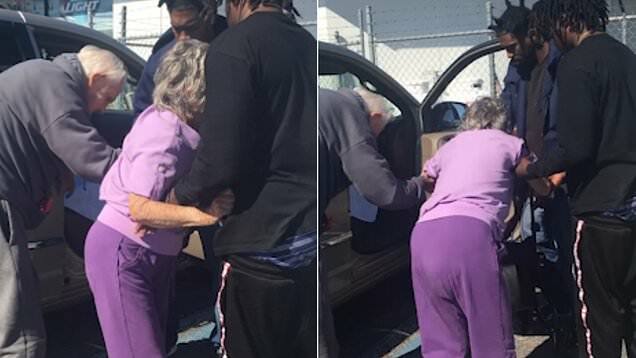 A very frail, elderly woman was being helped by three young men who were holding her up as she struggled to reach her car. Her husband, who is 100, was bent over a walker. Carnegie jumped out of her truck to help, but realized the men had the situation well in hand. That’s when she took out her cellphone. “I thought at the time they looked really beautiful and that was a nice view to see. I stepped back and just videoed them,” she told InsideEdition.com. She knew the men from the neighborhood. “They do a little rapping in the local community, so I know them and they know me,” she said. She’s been a deputy in Levy County for 18 years, and knows a bit about the men’s backgrounds, too. Her video, which she posted to social media, has racked up more than 23 million views. I didn’t anticipate for this to go viral. I thought it was more local for the community to see the effort they put forth in seeing a strange couple come through our town and not taking advantage of them,” Carnegie explained. The three men held on to Rose as she gingerly made her way. At one point, she stumbles and nearly falls. One of the men picks her up under her arms to keep her from landing on the pavement. “You take it easy, momma,” he says. As David hovers next to them, the men get Rose into the passenger seat and close her door. That drew exclamations from the trio. “That’s a good life,” one of the men says. Joc Smooth, 26, said he and his friends didn’t hesitate to help. “I saw that old lady struggling and about to fall,” he told InsideEdition.com. I asked permission to assist them,” and the husband said yes. “She was out of breath and so tired. She was so exhausted, I knew she wasn’t able to go much farther,” he said. He doesn’t think what he and his friends did is a big deal. “It was just instinct,” he said. The couple was on their way home from a doctor’s appointment. Rose has not been feeling well. Previous article Toddler Approaches Stranger At Airport And Their Interaction Has Everyone Bawling.